Our best-selling snack gift basket comes with a host of award-winning gourmet snack foods that are sure to satisfy any taste bud! Designed to be perfect for one but enough for a group, all the items inside are share-friendly and utterly delicious! They'll love the raspberry honey mustard pretzel dip, gourmet dipping pretzels, key lime white chocolate chip cookies, almond pecan crunch, peanuts, trail mix, buttered pecan crunch, peanut roll, organic coconut bar and cheese biscuits! Our snack gift baskets are the perfect gift for any occasion and are the safest bet for when you are not sure what to send! 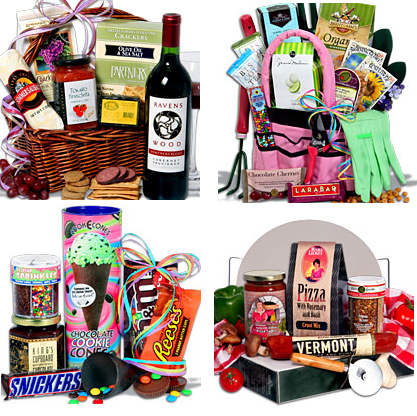 Don't take a chance, send this snack gift basket from GourmetGiftBaskets.com. Your snacks basket will arrive on time and we guarantee they'll love it! · Dipping Pretzels by East Shore Specialty Foods - 6 oz. - East shore is known for their plump and salts pretzel sticks which are meant for dipping. · Raspberry Honey Mustard Pretzel Dip by Robert Rothschild Farm - 7.8 oz. - This Robert Rothschild pretzel dip is a delicious blend of juicy raspberries, clover honey and tangy mustard. Not only does it have a distinctive flavor, but it's also all natural. Kosher and gluten free. · Key Lime White Chocolate Chip Cookies by Brent & Sam's - 7 oz. - Made from scratch, these cookies have a crunchy style and are tangy yet sweet to the taste. The key lime flavor is perfectly balanced out by the sweetness of the white chocolate chips. · Almond Pecan-dy Crunch by Morley Candy Makers - 9.25 oz. - This gourmet popcorn by Morley Candy Makers is renowned for being one of the best. With whole almonds and pecans, the irresistible buttery toffee evenly coats every bite. · Salted Peanuts in Box by Feridie's - 7 oz. - Feridie's uses only the best of Virginia's peanuts, the top 2% of the crop each year. Once picked, they are roasted in pure peanut oil and salted to perfection. · Petite Cheese Biscuits by Salem Baking Co. - 1.5 oz. - This beautiful tin is filled with savory, bite-sized biscuits that are baked with finely milled wheat flour and extra-sharp aged cheddar cheese. They are accented with the delicate crunch of toasted rice and a hint of cayenne and paprika. · Metropolitan Trail Mix by GourmetGiftBaskets.com - 4 oz. - Our metropolitan mix is all natural and contains exotic fruit like papaya and pineapples as well as raisins, cranberries and bananas. It also has whole peanuts, almonds and pepitas. It's a natural and delicious snack! · Buttered Peanut Crunch by Old Dominion Peanut Company - 10 oz. - These peanut squares by Old Dominion can be found in all of our snack gift basket made with a bit of brown sugar and only the freshest grade AA butter. These ingredients combined with lightly salted peanuts makes for a scrumptious and crunchy treat. · Peanut Roll by Dillon Candy Co. - 3 oz. - Dillion Candy starts their roll with a fluffy nougat center which is covered by a distinct layer of caramel and is then rolled in lightly salted peanuts. This amalgam of texture and flavors makes for the most delectable of peanut rolls. · Coconut Bar by Oskri Organics - 2.2 oz. - This bar is 100% organic made of only fresh coconut and rice syrup. It has a delicious crunch and is sure to satisfy any coconut lover; that's why you'll find it in our gourmet snack foods baskets. When visiting with family and friends during the Holidays, I often have a hard time trying to find just the right hostess gift. Recently we had the opportunity to check out the Classic Snack Gift Basket from GourmetGiftBaskets.com; packed with delicious treats and packaged beautifully, it's a gift that I could definitely feel confident about gifting! We absolutely loved the Raspberry Honey Mustard Pretzel Dip & dipping pretzels, and the Petite Cheese Biscuits! We topped off our snacking adventure with some of the sweets from the basket (YUM!) the Organic Coconut Bar was so delicious, and the Buttered Peanut Crunch was a fast favorite with the kiddo's. With an array of gift baskets for every occasion, there's something for everyone on your Holiday list! Amazing quality products, beautifully packaged......delivered right to your door! Snacking at it's finest! One Lucky Reader will receive the GourmetGiftBasket.com Classic Snack Basket (Pictured Above Top) (RV$59.99)! Leave a comment~ Visit http://www.gourmetgiftbaskets.com/ and let me know another gift basket you would love to gift or receive this Holiday Season. The comment is considered your entry. 2) Tweet ~ #WIN a GourmetGiftBaskets.com Classic Snack Gift Basket ~Packed with yummy gourmet snacks! @savvycouponmom http://bit.ly/e4nUZ2 #GIVEAWAY (can be repeated twice daily for additional entries~ copy paste please~cut and paste- the bit link must be posted in the tweet - I will check) (Additional 5 Entries - 5 Comments). I would love to try the Wine Horse Trio Wine Gift Basket. I love the From the Kitchen of the Barefoot Contessa Basket. I follow on GFC. i follow via GFC and i would love to have the Chocolate Gift Basket Deluxe - Sweet Decadence. I think that the Holiday Sweets & Treats Snowflake Tin™ – Christmas Gift Basket is beautiful and would make a great gift for anyone that is hard to shop for. I also entered the flip giveaway!